We cannot lose the progress we have already made in this revolution. We must move forward, not backwards to bring this country back to civility. We must restore democracy and social, economic and healthcare justice in America. I agree. 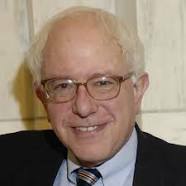 Bernie Sanders needs to run against Hilary if he doesn't get the nomination. If it is true, as he says, that the elections are rigged and that Hillary is bought by the corporations then it doesn't make any sense for Bernie to support her. He needs to run against her, and if he does so he will probably beat her. Bernie's supporters need to shout the message loud and clear so that Bernie knows that they will not be at all happy with him if he decides to support Hillary Clinton. They need to let him know that they will back him all the way if he decides to run as an independent. If Bernie Sanders really wants a revolution then he needs to fight all the way and not accept defeat. What kind of revolution is it when you give your support to someone who has been bought out by the corporations. That seems like business as normal to me. Bernie's supporters need to INSIST that Bernie fight to the end and never give up.